Since 2008, our parish has served Panera Bread products each Sunday (12:30–1pm) from the steps of our church. Volunteers faithfully collect the bread from Panera each Saturday night, bring it to the church, and various teams help distribute this bread each Sunday (in rotation.) On average, we serve about 20 families per week and then pass the remaining bread products on to either the elderly or student families. Contact our office assistant if you would like to pick up bread on Saturday nights or help distribute the bread on Sundays. 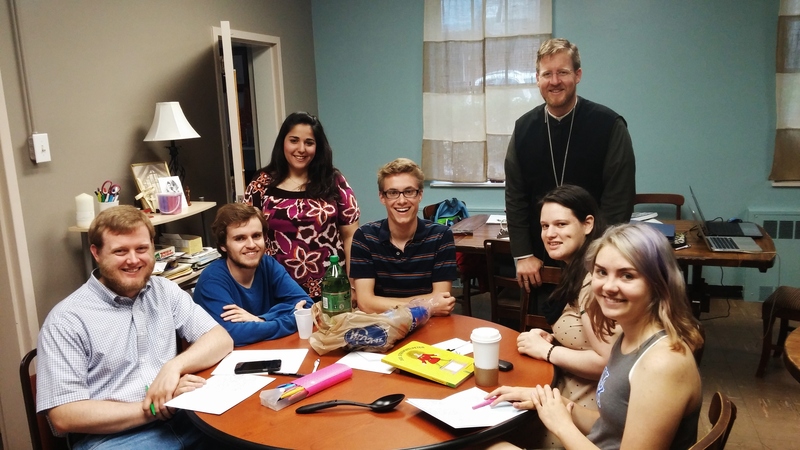 Since 2007, St. Athanasius has been involved in campus ministry at various levels. At the University of Kentucky (about 15 miles away from the church) in Lexi ngton, St. Athanasius has—along with our two Orthodox sister parishes—co-sponsored the Orthodox Christian Fellowship (OCF.) Our clergy and laity have been involved in the UK OCF for over a decade. Clergy and laity also visit the campuses of Asbury University and Berea College with regularity (holding services several times a year at Berea.) Scores of Asbury University and Seminary visit St. Athanasius each year (and many join, as we are the closest parish to Wilmore, KY!) Throughout our parish’s history, we have always had a sizable number of college students attending our services and being part of our community. See Fr. Justin if you would like to help out with campus ministry. 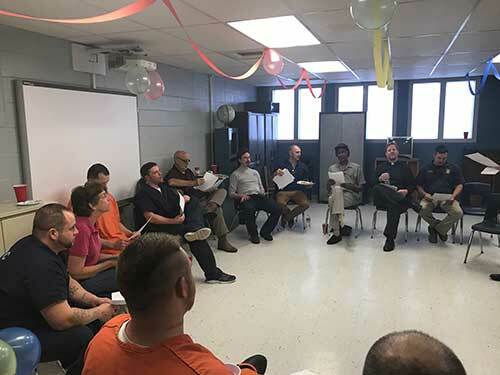 Over the years (since around 2009) at least 7 members of our parish have been directly involved in jail ministry at both the Fayette County Detention Center and, more recently, right here in our local Jessamine County Detention Center. Many others have supported this work without entering the jail, too. Contact Fr. Justin if you re interested in learning more about how to serve at the local jails. 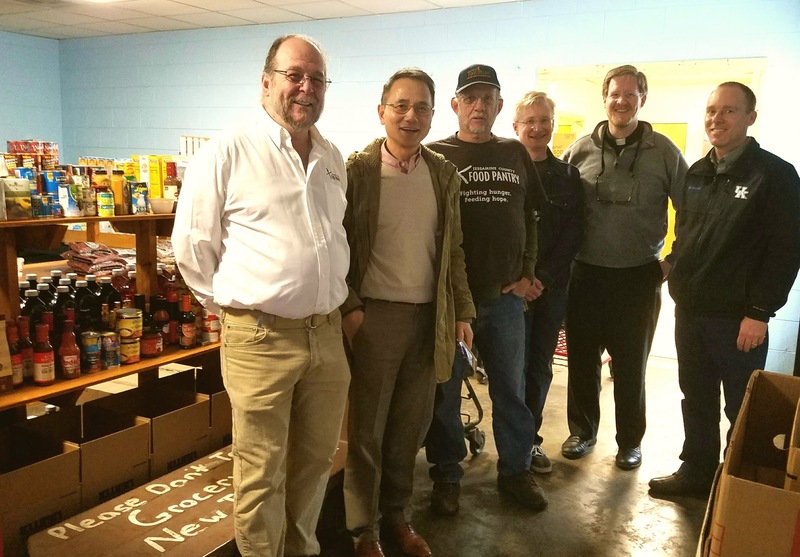 For many years, St. Athanasius has supported the humanitarian work of Kentucky Refugee Ministries. KRM helps resettle families who seek either political, economic, or environmental catastrophe. Parish members have helped set up apartments, stock pantries, and help the new immigrants get settled in. Hannah Kamau is our point-person for helping refugees. 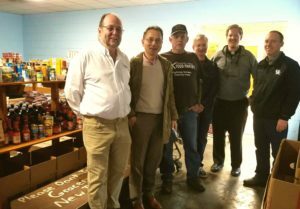 In recent years, St. Athanasius has developed a partnership with the Jessamine County Food Pantry, our local USDA-sponsored pantry, affiliated with Lexington-based God’s Pantry. Our parish found that we could not meet the needs of people visiting us and asking for food. We also realized that by supporting the food pantry, we could meet their needs and do it very economically. In 2016, Fr. Justin was asked to join the JCFP board and in 2018, Matushka Tamara joined the board. 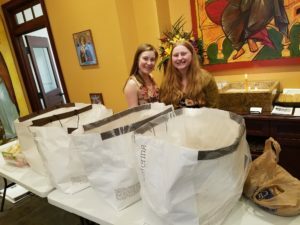 It is our hope to keep a parish member on the board and help connect the charity work of the pantry and the parish. Speak with Fr. Justin or Matushka Tamara if you would like to get involved! In one sense, everything we do at St. Athanasius is “outreach and evangelism.” Every liturgical service, every bit of education, every act of Christian service: these are all ways we reach out and share the Gospel. However, we do try to remind ourselves to be intentional about evangelism. 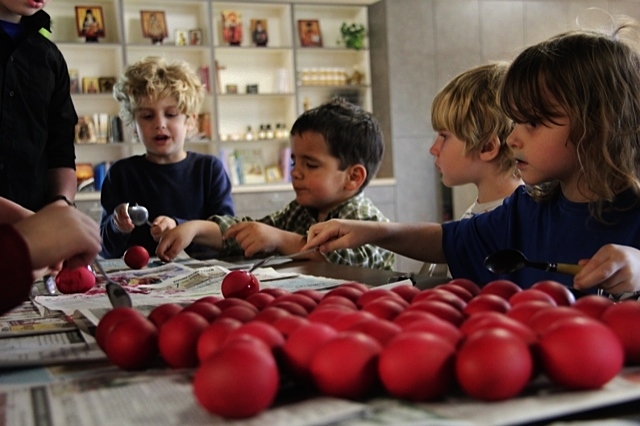 One way in which we do this is to support the work of the Orthodox Christian Mission Center. 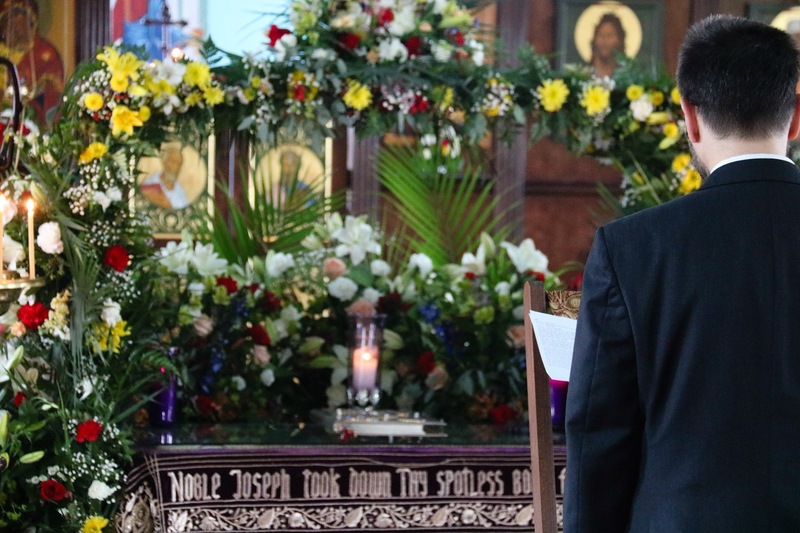 In addition to modest support for various OCMC missionary families over the years, we have regularly participated in the “Support a Mission Priest” program, to fully underwrite the ministry of a priest overseas for one year at a time. More locally, our parish leadership has strategized (and occasionally held services) in preparation for planting daughter parishes throughout the state. 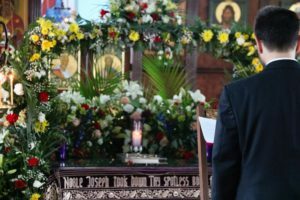 Contact the priest if you would like to actively support the work of proclaiming Christ in an Orthodox manner in cross-cultural situations! St. Athanasius actively supports (and draws spiritual nourishment) from our local monasteries. 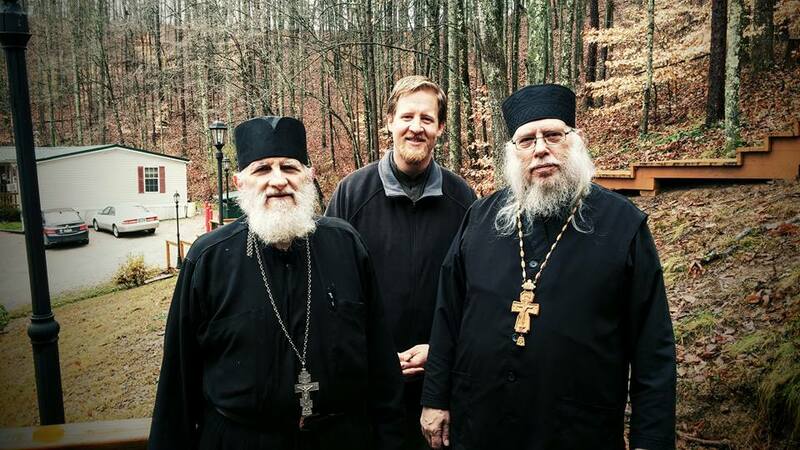 Holy Cross Hermitage (a ROCOR Men’s Monastery) in West Virginia is a 3-hour drive. Two Romanian OCA Women’s Monasteries, Holy Transfiguration and Holy Dormition, are each about 6 hours away by car. These communities are well-known to our people (pilgrimages welcome!) and we delight to support and connect with our monastic brothers and sisters. Contact the priest for more infomation about visiting these wonderful monastic communities! Our parish choir has been led for many years by Reader Rick Cook. He has been assisted most recently by Matushka Tamara Patterson and Zoe Zamora, who have received training at St. Vladimir’s Seminary and Holy Trinity–Jordanville, respectively. The choir holds practices as announced. If you like to sing or desire to learn how to sing, by all means ask one of these directors how you can come alongside this vital parish ministry. The altar-servers assist in the liturgical services of our parish. 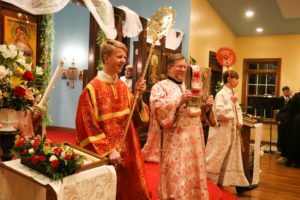 Generally, servers must be at least eight years old, be regular in attending the parish, and have the priest’s blessing to serve. Deacon Simeon, assisted by Subdeacon Bert Walther, coordinates and schedules these young men. It is considered a great privilege to assist the clergy in this ministry in the altar. The handmaidens assist in serving the antidoron (not consecrated bread) and zapivka (not consecrated wine) that is consumed in the Slavic tradition right after people receive Communion. Contact the parish office assistant if you would like your daughter to be added to the rotating schedule. 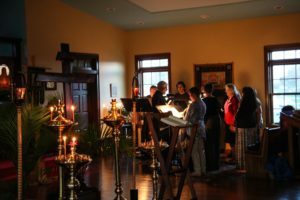 While every member of the parish is a “greeter”—and we don’t ever want to forget that—it is helpful in parish life to have men, women, and even children who both welcome newcomers in the narthex before and during the Liturgy and help “keep” the doors, making sure people enter and exit the nave (main church) at appropriate times. Contact Paul or Linda Frangedakis, who coordinate/schedule the greeters and doorkeeper, if you would like to help with this important ministry of welcoming and maintaining order. 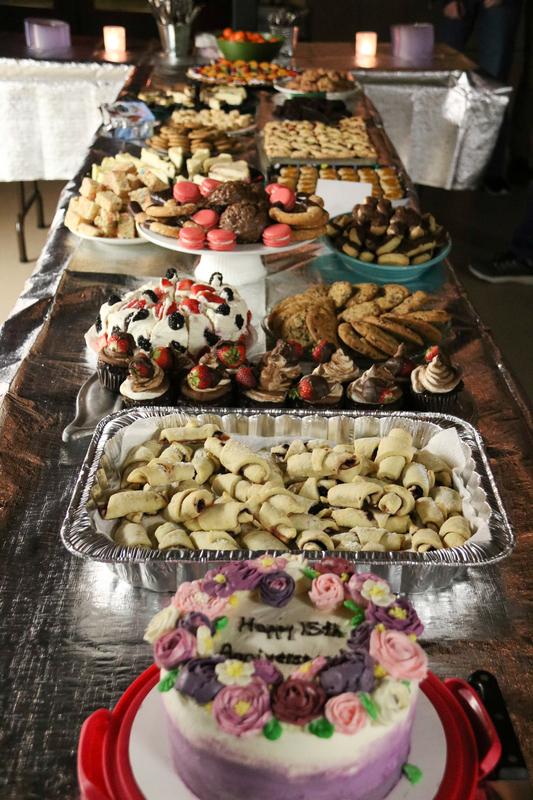 One of the founding traditions of St. Athanasius Orthodox Church is a weekly meal. 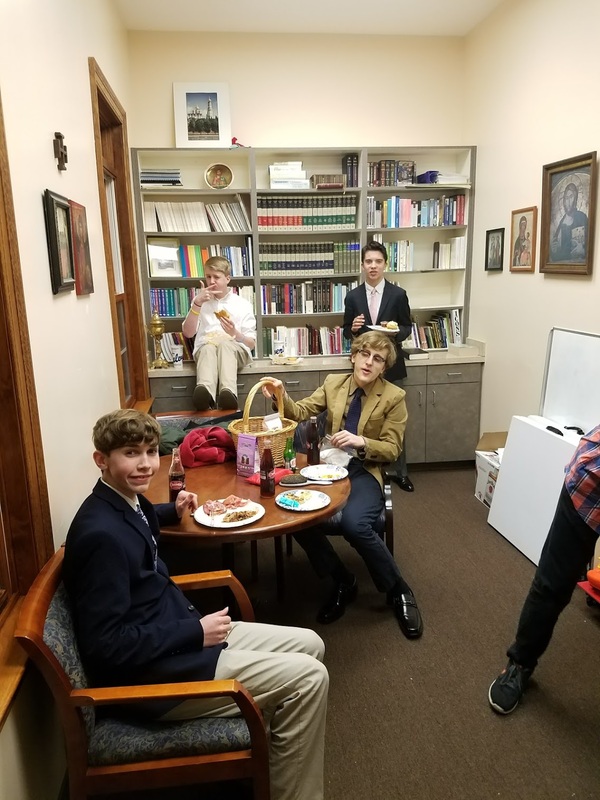 While our Fellowship Meal has developed over the years, our people remain committed to a lively time of fellowship after the Liturgy. Our rotation of 4–6 teams coordinates a light lunch each week and attempts to provide a healthy atmosphere for people visiting every Sunday. We are always grateful when new members are able to join a team and chip in to this vital ministry of hospitality and community-building! Our office assistant Kathy coordinates the teams. She is happy to answer any questions you might have about how to get involved. 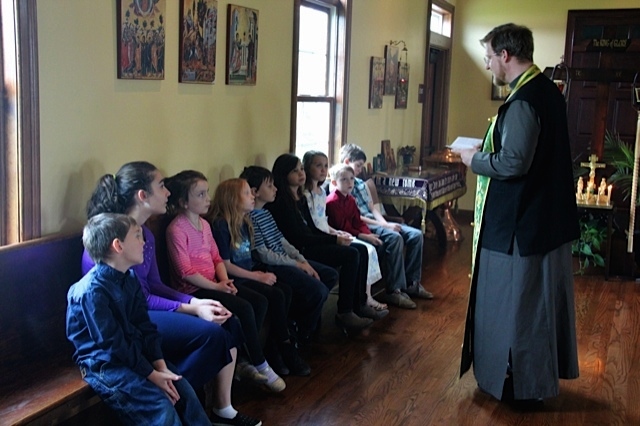 Throughout our parish history, St. Athanasius has been committed to an age-appropriate Sunday School. While our model has evolved over the years, we remain committed to Sunday School—from our youngest ages up through adults, during the “school year.” On Wednesday nights at 7:20pm (following our weekly Wednesday Vespers at 6:30pm,) we also offer a weekly Christian Education class throughout the year, with topics varying from basic catechesis to Bible studies to various topical series (as announced.) Mary Cook coordinates our “school year” Sunday School and Fr. Justin ensures that there is a Christian Education event each Wednesday night, 7:20–8:20pm. 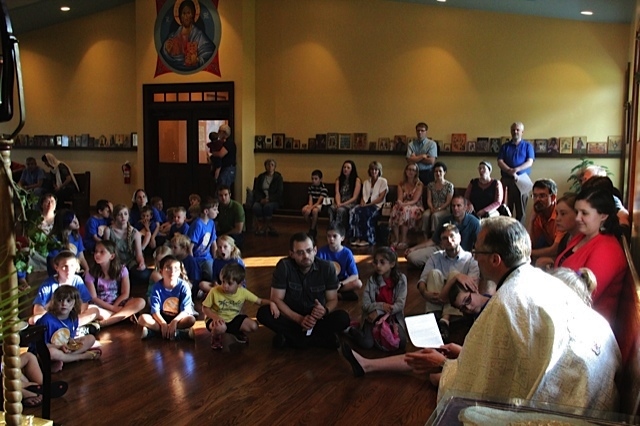 Every summer since 2002, St. Athanasius has participated in the Lexington Pan-Orthodox Vacation Church School. VCS usually runs for five days, every morning, and is tailored for elementary-school-aged children. VCS features morning prayers, an age-appropriate scriptural lesson, various activities (e.g., music, crafts, outdoor games.) In recent years, we have begun to host the VCS at our church campus in Nicholasville. Full information on the Vacation Church School is generally available by May each year. Contact the church office for more information. 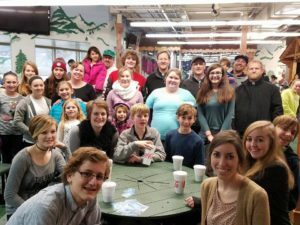 Since 2009, St. Athanasius has had an active youth group, serving ages 12–18. Our youth group leadership team is comprised each year of at least four adults (2 men and 2 women) and our goal is to provide 1–2 youth events per month, especially during the school year. We usually meet on Sunday evenings (6–8pm.) Each year, we hold an opening day retreat in September, an overnight retreat at a monastery or convent, a pre-lenten banquet, and and end-of-year hike at the Red River Gorge. In 2016, our priest made a presentation about the St. Athanasius Youth Group ministry (PDF). A part of our youth ministry vision is our youth participating in an Orthodox summer-time youth camp. One camp many of our youth attend is Camp St. Thekla. Contact the priest or church office for more information. 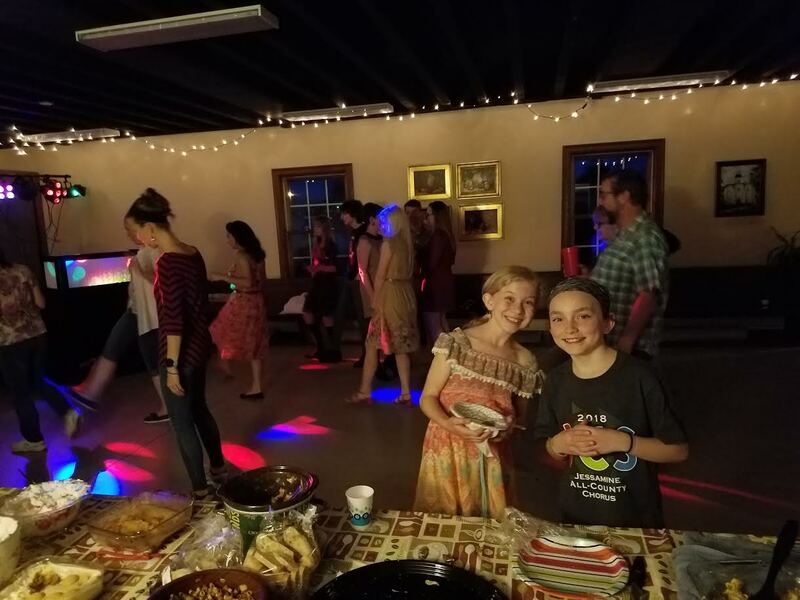 Since 2010, ladies in our parish have been actively gathering young women (ages 12–18) about twice a month on Sunday evenings (on Sundays when youth group is not scheduled) for semi-structured visits. Girls group has been a safe place for many or our girls to meet, ask questions, and support each other during their teenage years. 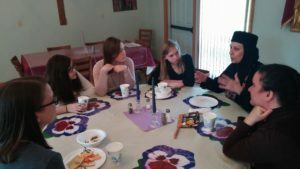 This article describes the Girls Group Ministry. For more information, reach out to Sarah Werner or our church office. 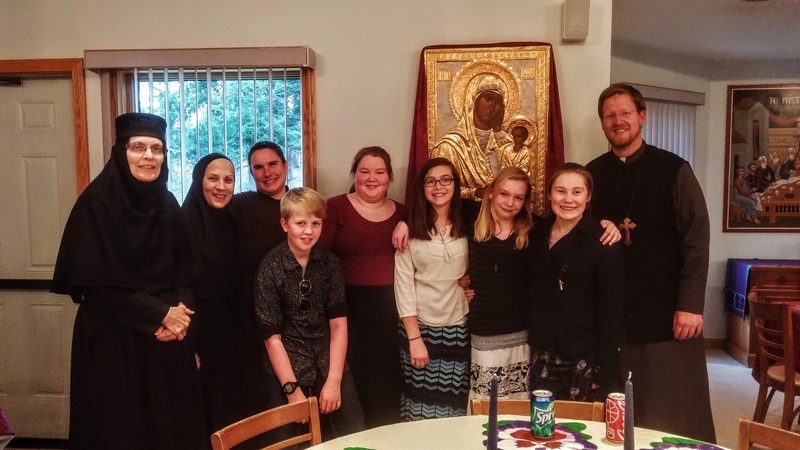 In 2017, St. Athanasius was selected as a “Telos Pilot Parish.” The Telos Project is run by the Office of Vocational Ministry at Holy Cross Greek Orthodox Seminary near Boston and is funded by the Lilly Endowment. Between 2017 and 2020, St. Athanasius is one of the 3 OCA parishes slated to receive $25,000 from Telos to engage young men and women (“emerging adults”) ages 23–29. 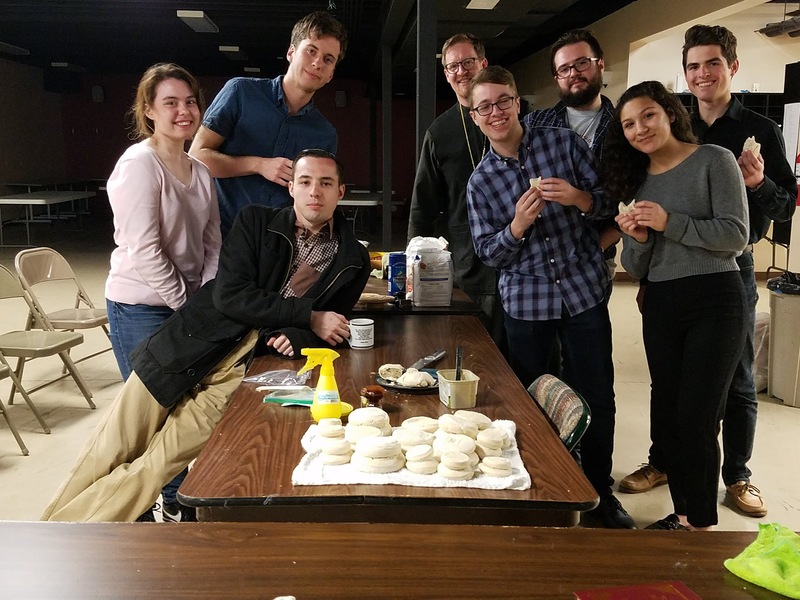 We are invited to experiment in various ways as we try to connect our 20-somethings to church life and share those experiences through Telos. Our chairs for this work are Bert Walther and Kriss Whiteman. Since the parish’s founding in 2002, we have had a bookstore that features an assortment of Orthodox books and devotional items. 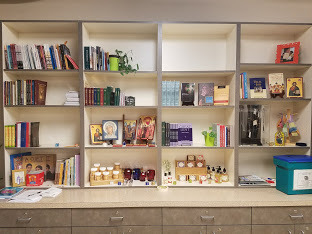 Our bookstore is located in the parish hall, on the wall directly underneath the altar. Garrett Sinard works with Fr. Justin and our office assistant Kathy to keep the bookstore well-stocked and in order. Please reach out to Garrett if you have items you would like to see added to the bookstore. For many years, the women in our parish have gathered 6–12 times a year for purposes ranging from fellowship, to charity, to spiritual reading, to special acts of hospitality. The heavenly protector of our sisterhood is St. Elizabeth the New Martyr. 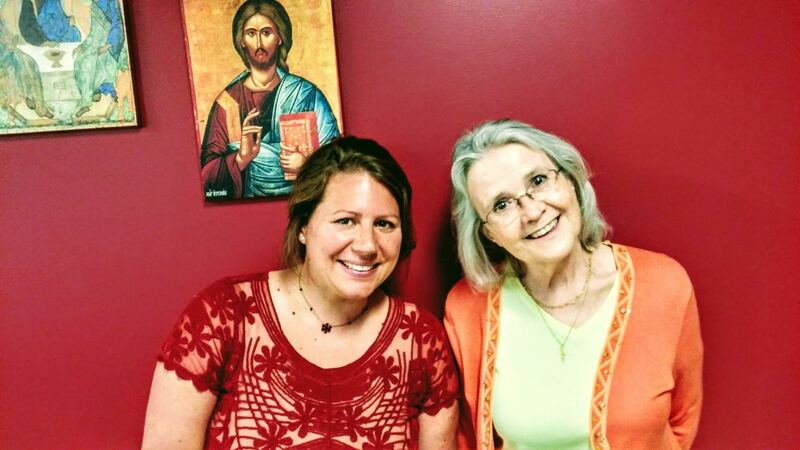 Audrey Wagner (pictured left) coordinates the activities of the St. Elizabeth Sisterhood. 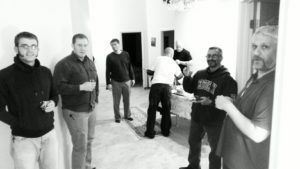 Our informal Men’s Nights happen 4–5 times per year and are strictly times for fellowship. We often meet at the home a parishioner who owns a lakehouse near Danville. Our events are usually posted on all our calendars and announced in the bulletin. Worshiping God, for us Orthodox, is not just something we do with our minds and intellect, but with beauty, as well. Our parish laity have taken a strong interest in making sure the church is adorned festively to mark important moments in the life of the church year. For many years, Marijim Reeves has coordinated the work of interior beautification and mentored a number of young people in learning these skills, too. We try to take good care of our church’s exterior—for even this can glorify God. 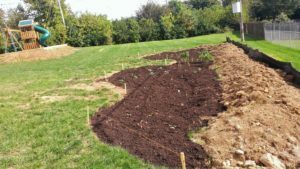 Various projects in recent years have included the establishment of a rain garden, new plantings of trees and shrubs, placement of mulch, and the planting of various seasonal flowers. Mary Bradshaw, Ellie Sutter, and Linda Frangedakis (among other volunteers) play a major role in coordinating efforts outdoors. See them if you have any suggestions or wish to volunteer! This is one of our least organized ministries or stewardships—and one in need of the most help! Keeping tabs on equipment wear, the HVAC system, and other basic maintenance challenges is needed. Please reach out to Fr. Justin if you are interested in taking an active role in this much-needed. 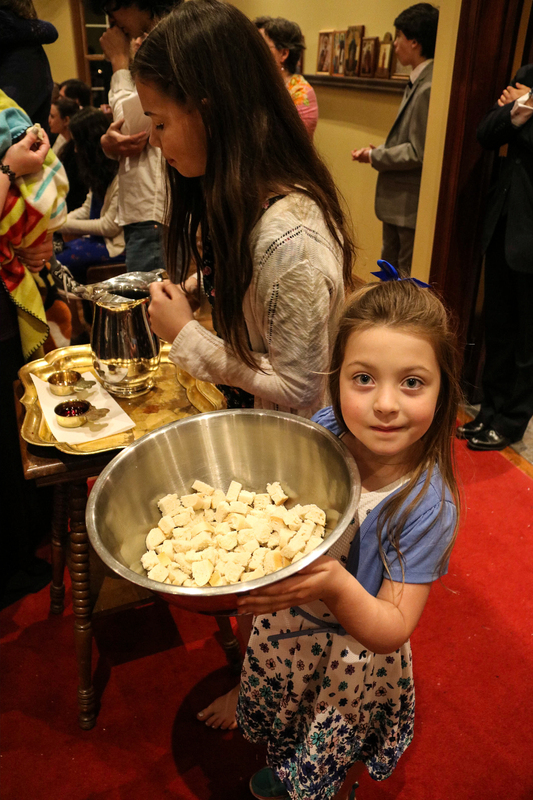 In the Orthodox Church, all of our communion bread is baked by our parishioners! We usually have 5-7 people who regularly make it. We are often in need of new volunteers to come alongside and join the rotation. If you would like to learn how to make the bread or find out more, reach out to the priest or the office assistant. 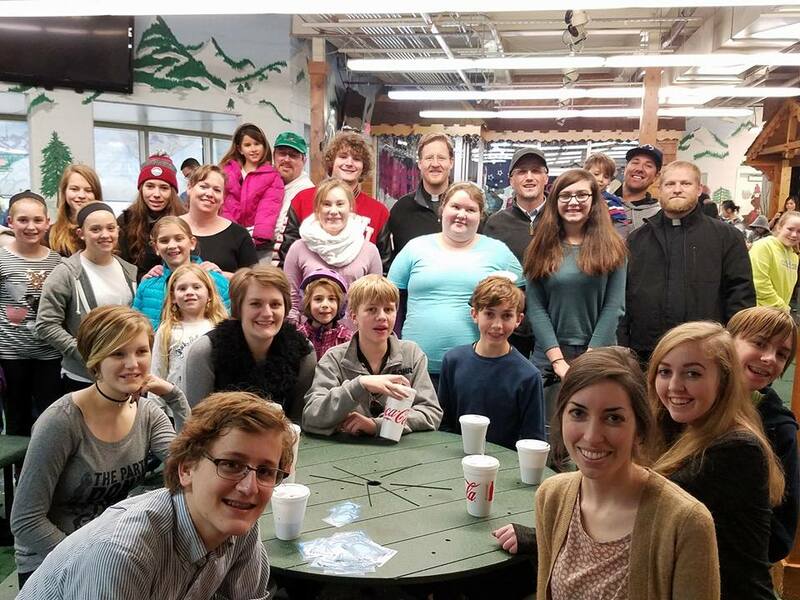 Whenever life presents a curve-ball or other challenge, our parish family tries to step up and help out with meals. Especially in the event of a death, a birth, or some other major life trauma (e.g., moving,) we encourage parishioners and parish regulars to reach out and let us know you would like some help with meals. For over a decade, Tabitha Naughton has faithfully organized this effort. Reach out to her directly or to the office assistant if you have any questions. In 2018, our new (phase II) “Archangel Gabriel Belfry” was completed with funds donated in memory of Gabriel Zamora, a 19-year-old parishioner who passed away unexpectedly in 2016. 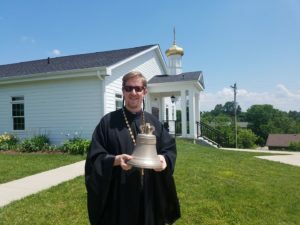 Bell-ringing is an ancient (Russian) Orthodox Christian art. We are developing young women and men to assist in this ministry of beauty. 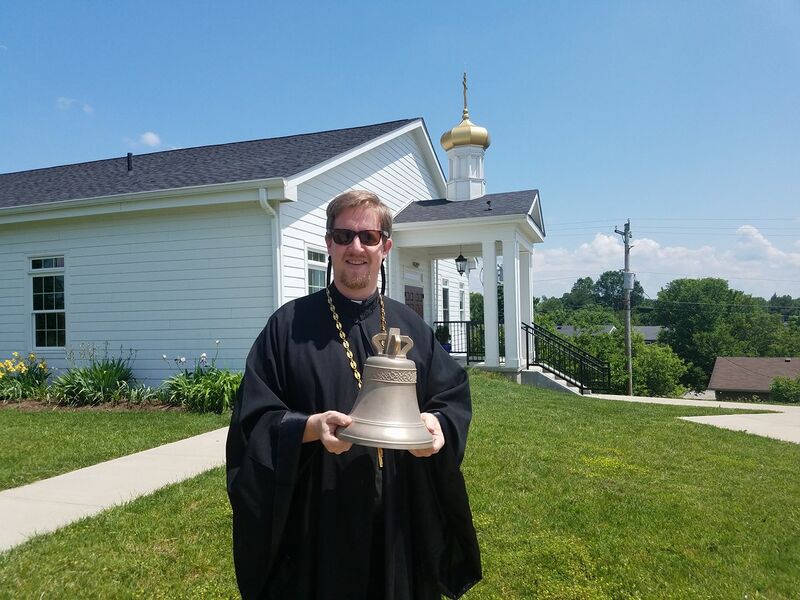 Stay tuned for more information about how to get involved in bell-ringing, especially as we complete the purchase of our complete set of six Russian-made bells over the next several years. From the parish’s beginning, we were deeply concerned with the question of child safety, particularly with regard to sexual misconduct. In 2011, we formalized much of what we had been doing informally by adopting our first Child Safety Policy (PDF). In 2019, the parish council adopted an updated Child Safety Policy (Policies & Procedures), that includes new elements to meet the changing needs of the parish. A Child Safety Committee oversees the implementation of our CSP. Current members of this committee include (as of 2019): Deacon Simeon Siskar, Rebecca Wilson, and Mary Cook. Our office assistant coordinates communication among our committee members and administrates the Child Safety Policy under the committee’s oversight. We encourage all of our parishioners to be knowledgeable about our CSP and to help parish leadership enforce it faithfully and vigorously.